Manila Bay’s ecosystem is not dying. In fact, a new sardine species, Sardinellapacifica, has been discovered in Manila Bay waters and in other parts of the country. 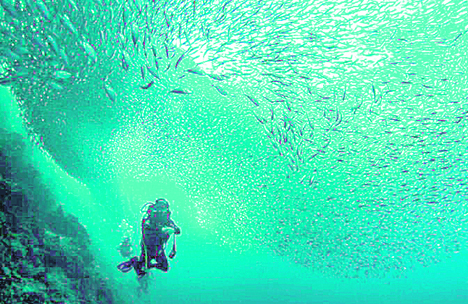 According to a peer-reviewed journal article, Japanese taxonomists HarutakaHata and Hiroyuki Motomura collected samples from Manila Bay, Quezon, Sorsogon and Samar and those revealed distinct characteristics from other sardine species, concluding a new species of sardines was found only in the Philippines. “We appeal to President Rodrigo Duterte to stop all reclamation projects lined up in Manila Bay,” said Gloria Estenzo Ramos, vice president of Oceana in the Philippines. Manila Bay was identified by the Bureau of Fisheries and Aquatic Resources as a spawning area of sardines and is still one of the main fishing grounds of artisanal fishermen who depend on the sea for their livelihood. Sardines is on top of the kinds of fish caught in the area. “Instead of dumping and filling our seas that bury and destroy mangroves, sea grass beds, corals and other fisheries habitats, let’s collectively save and protect these from destruction because of so-called “development” projects,” Ramos said. Oceana appealed to Duterte to review and assess the projects submitted to the Philippine Reclamation Authority that would result in irreversible damage to the marine habitats. Ramos said the irreparable destruction in Manila Bay would leave the artisanal fishermen almost without income because of low or no catch, and their families hungry and displaced. “These projects violate our constitutional right to balanced and healthful ecology, as well as our fisheries and environmental laws,” Ramos said. Oceana is co-organizing with Kalikasan People’s Network for the Environment, Pambansang Lakas ng Kilusang Mamamalakaya ng Pilipinas, and Center for Environmental Concerns a People’s Summit on Reclamation on March 26 to 27. The summit will discuss scientific studies and legal review with the government, academe, scientists and legal experts, non-government organizations and the urban poor and coastal communities in Manila Bay.